The high performance luminaire is designed for cutoff applications where long life, low maintenance, and consistent color rendering is required. 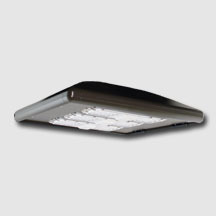 Areas with limited accessibility due to fixture location or where heavy pedestrian traffic makes maintenance difficult are ideal applications such as building facade lighting or wall mounted security lighting. The heavy duty housing is constructed of extruded aluminum. The optical assemblies are sealed in place using a silicone gasket for weather tight protection. Modular LED bricks wired in parallel for ease of maintenance. ETL listed for wet locations (IP64). Additional IP66 rating available upon request. Made with a state of the art UV stabilized acrylic high performance refractive optical assemblies that use high transmicity materials to achieve precise photometric distributions. Available in Type II, III and IV beam configurations. Available in up to a 3 brick LED system in 5000K Cool White (+/- 500K) or 4100K Neutral White color temperatures (70 CRI min.) propagated with Philips Lumileds LUXEON® T LED’s or Osram equivalent. Available with 90-300V 50/60 Hz Class II power supply. LED’s rated over 355,000 hours (TM21 Calculated L70) at 25°C ambient temperature with selectable 700mA, 1050mA and 1400mA operation. Lumen Maintenance >97% at 50K hrs. 347V and 480V input options available. Standard 0-10V dimming. Fixture provided with integral 10kV surge protection that meets IEEE C62.42.2-2002. Built-in Active PFC Function. LED Power Supply conforms to UL1310 Class 2 and UL8750 standards and is IP67 rated for wet locations. The fixture can be surface mounted over a standard 4” box (provided by others) using the pre-set mounting holes Mounting hardward provided by others. LED Power Supply listed for wet locations (IP67). LED bricks ETL listed for wet locations (IP64). Meets US and Canadian safety standards. -40°C to 50°C ambient operation. RoHS Compliant.